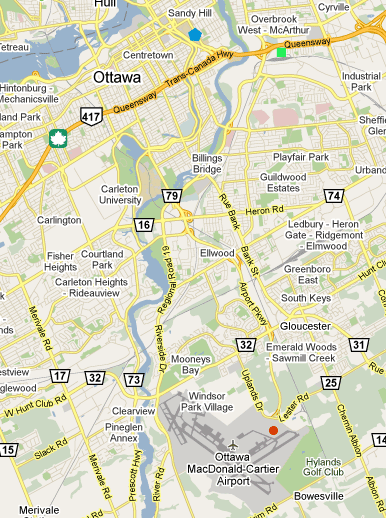 The University of Ottawa is about a 20 minute drive from Ottawa International Airport (which is the closest airport); although the airport is international it is relatively small and although there are direct flights from the USA and some places in Europe (e.g. London Heathrow), transfers to smaller planes from Montreal's Trudeau Airport or Toronto's Pearson Airport are quite normal (which are about 1 hour away by plane). Taxi ~ there are usually many taxis available, just outside the airport. Should cost roughly CA$30 to get to the University direct in around 20 minutes (depending on the time of day and traffic). Please note that Taxi's will charge you extra for baggage. Shuttle Bus ~ the YOW Shuttle bus basically goes past all the main hotels in Ottawa, it also stops outside Ottawa University. One way trips cost CA$15 and round trips cost CA$25. However, they accept major credit and debit cards, as well as cash (so cheaper than a Taxi, easier if you don't have cash compared to the bus).